Organized as self-defense forces, some residents of the Mexican state of Michoácan have been attempting to regain control of their towns from powerful organized criminals. Although these Mexican militias have received a fair amount of media coverage, its fascinating social media presence has not been examined. Saiph Savage, a grad student at UNAM/UCSB, and I have started to collect some data, and wanted to share some initial observations of one of the militias’ online spaces: Valor por Michoacán, a Facebook page with more than 130,000 followers devoted to documenting the activities of the self-defense militia groups in their fight against the Knights Templar Cartel. We contrast this page with a similar one from a different state: Valor por Tamaulipas, which has enabled residents of that state cope with the Drug War related violence. In 2011, a group of vigilantes from the small mountain town of Cherán managed to expel a band of illegal loggers backed by La Familia Cartel. This uprising became one of the first cases of ordinary citizens joining forces to challenge Mexico’s criminal organizations. Two years later, new armed groups known as the autodefensas or “self-defense forces” emerged in the same state of much stronger and well-organized, presumably with the backing from wealthier ranchers. The groups gained national and international attention after successfully taking over a number of bigger towns previously controlled by the Knights Templar Cartel (a spin-off of La Familia). These new groups are similar to the Cheran group; however, their activities are more actively documented on social media, especially on Facebook, where people show support for the movement and interact with one another. We have previously reported how citizens come together online to form alert networks; however, this form of offline collective action coupled with online action is a new phenomenon in the Mexican Drug War. The Facebook page on the spot is Valor por Michoácan, Spanish for “Courage for Michoácan.” The page is particularly fascinating because it has succeeded in linking offline and online collective action by documenting the activities of the autodefensas in their fight against the Knights Templar and recruiting new supporters. This is not the first time Mexico witnesses these “courage for ” Facebook pages, though. In fact, the “about page” of Valor por Michoacán itself references Valor por Tamaulipas as its inspiration. The Tamaulipas page has been documenting the violence in the state since 2012, despite its administrator being targeted by the cartels, and has focused on helping people spread alerts about unsafe situations, known as situaciones de riesgo or SDR. That said, this page has not focused much on forming groups to rise against the cartels. To better understand how the Facebook page Valor por Michoácan has evolved and to compare it with the Valor por Tamaulipas, we collected the two “Courage for” pages’ full set of posts (5,195 for Michoácan and 1,914 for Tamaulipas) between the birth of Valor por Michoacan in August 19th, 2013, and February 18th, 2014. The table below summarizes the analysis of information collected from the two pages. Paradoxically, we find that although the Michoacán page is qualitatively more focused on offline actions, the Tamaulipas one has a lot more postings with specific location references, and time details. This is in part because Valor por Tamaulipas focuses on sharing reports of unsafe situations (“situaciones de risego”) like the ones we have documented happening on Twitter. The Valor por Michoacán page appears to be used more as a platform to motivate residents to take action or show support for militias, often posting their propaganda. For example, over 40% of the posts from this page incorporate photos and/or videos. In contrast, only 5% of the posts on the Valor por Tamaulipas page include pictures or videos. 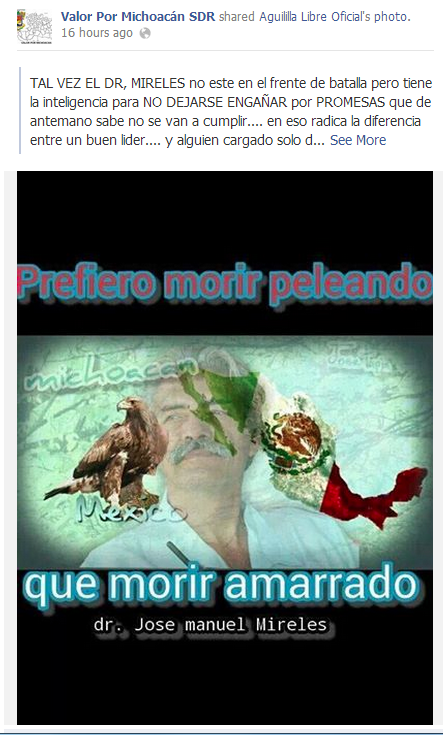 Pro-militia imagery in “Courage for Michoacan” Facebook page showing one of its leaders. When looking at the number of posts shared daily on the two “Courage for” pages we notice spikiness in Valor por Michoácan, in contrast with more cyclical activity in Valor por Tamaulipas (see below). 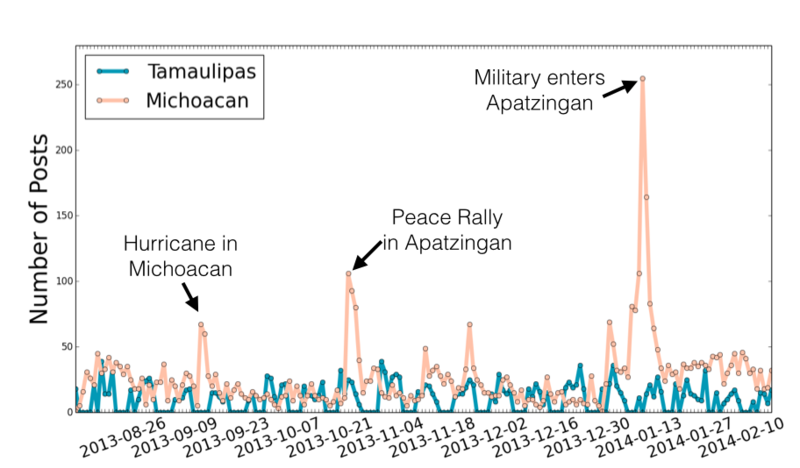 Most of the peaks on the Valor por Michoácan page correspond to major offline events. For instance, the biggest spike occurred on January 14th, 2014, the day military entered the city of Apatzingán to disarm the self-defense forces. Similarly, on September 17, 2013 the page’s activity had a peak of activity when Hurricane Ingrid hit the sate. Unlike Michoacan, the Tamaulipas page is a lot more cyclical. This could be partly to the volatile nature of the situation in Michoacán in this time period, as well as due to the affective desensitization Tamaulipas residents are experiencing after many years of recurrent violence. In order to get a sense of how themes of the posts for each page might change over time, we started by plotting the percentage of posts containing the page’s most frequent terms (see below). What we noticed, again, is a cyclical Valor por Tamaulipas, for exaple showing a consistent presence of terms like “ayer” (yesterday) and “colonia” (neighborhood). These terms are are often associated with reports of violence. Also, we see where these reports might be coming from: Ciudad Victoria, Reynosa and Matamoros. In contrast, Valor por Michoácan seems to have changed more over time. Initially, the page made references to the state (Michoacan) and to the “pueblo” or “the people,” presumably to establish a populist alterantive to the local cartel. By November, the words associated to “narco” peaked matching the time when the self-defense forces took over towns formelly controlled by the narcos (i.e., Knights Templar). Also, we notice a small but consistent presence of mentions of the government throughout the period we observed. Although these two “Courage for” pages carry similar names, and both describe themselves as safe spaces to report incidents, their posting patterns and goals seem to be very different. When the self-defense forces had the most vigorous opposition from the government, the Valor por Michoácan community became increasingly active online. By strategically posting patriotic photos and videos, Valor por Michoacán may be effectively and unconsciously creating a public relations campaign for some of the militias’ offline campaigns. This might help the web page recruit more people and gain support throughout Michoacán. As we continue to dig into this data, we are interested in better understanding the nature of the messages that incite the most reactions online and offline, and to see if there are ways of examining if and when online interactions translate into offline collective action.